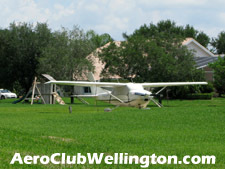 The Wellington Aero Club is a private airpark community consisting of 248 homesites. Each homesite sits on approximately one acre each - with luxurious custom built estate homes. In the center of the community there is a 4,000 foot lighted runway (paved in 2012) for use by Aero Club residents. Aviation gas is available at the on-site refueling facility. There are runway, taxi-way and tie-down homesites - some homes even offer their own private hangar. Since the runway is centrally located within the community - runway access is quick and easy. Wellington Aero Club residents not only enjoy the luxury of flying right to their doorstep but also have access to the community clubhouse. The clubhouse features a gameroom, billards, and a gathering room adjacent to a fully equipped kitchen - perfect for hosting parties and other special occasions. The friendly residents here gather often for evening socials, yoga classes and holiday parties - enjoying the company of other flying enthusiasts. Live your dream and fly privately into this community's runway. Live with your plane in quiet seclusion only minutes from Wellingtons fine shopping, restaurants and golfing options. But owning an airplane is not a requirement to live in the Wellington Aero Club, so feel free to enjoy the easy access to miles of beaches on the Atlantic Ocean, some of the best fishing spots in the world, and access to hundreds of top notch golf courses, the equestrian venues of the International Horse Show, the Polo grounds and the Winter Equestrian Festival are also just a quick drive away - making this community ideally located for everyone - no matter what your interests are. 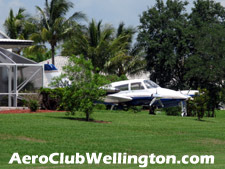 AeroClubWellington.com and Brenda Brooks are not affiliated with the community Aero Club located in Wellington, Florida.